The installation of the latest 2013 edition of AVG AntiVirus is smaller and takes less time to install than the edition from a couple years ago. The installer is only 33MB and does not require a reboot like many antivirus applications do. However, when installing the program you must explicitly opt out of the nuisance toolbars that the AVG AntiVirus installs, and even when you do opt out of this, your default search engine in Firefox is still replaced by SafeSearch. To add insult to injury, your browser windows are automatically closed when you run the installer. The latest trend is to create programs that mimic the style of the Windows 8 interface and AVG AntiVirus has joined them by making their interface fit right in with the newest Windows environment. As you can see, the new AVG AntiVirus interface looks similar to the Metro interface in Windows 8, although we have found that it appears to be essentially the same as the Windows 7 version with simple modifications for Windows 8. The latest innovation with AntiVirus suites has been the file reputation based scanning, which makes use of the userbase of AntiVirus users to submit suspicious files to the cloud and share the data in a social network fashion. This feature makes it easy for new threats to be detected early and also makes scanning times quicker. AVG AntiVirus 2013 of course includes an implementation of this feature. Also, there is now ransomware and fake antivirus blocking in addition to the expected antivirus, antimalware, and antirootkit detection. AVG AntiVirus 2013 will add several seconds to the boot time of your computer depending on if you have a solid state drive or not, the difference can be up to 15 seconds. Also, it may take a few extra seconds for your computer to shut down when AVG has been installed. The most surprising result seen with the performance of AVG AntiVirus 2013 is that some tasks on your computer are actually faster than a bare PC with no antivirus. The reason for this is complicated but the explanation given is that your files are accessed differently by the computer once you have AVG AntiVirus installed and this some how optimizes the performance. The actual scan times of AVG AntiVirus 2013 are quicker than before and are among the fastest scans when compared to other AntiVirus software suites. AVG Anti-Virus is very popular not only with end users but also businesses as well. Businesses use file servers and have many computers networked together, so an antivirus is a wise software to use within businesses. By using AVG Business Edition, less time will be spent on dealing with virus infections and more time spent on working on your business. Businesses now must make cyber threats and security a major focus within their infrastructure making it a board room issue. Recent news about infiltrations into major businesses and the disruptions caused by these intrusions has made business security a top priority for many companies that deal with technology. Common devices such as netbooks, mobile phones, and tablets enter and leave the workplace daily with the possibility of outside infections coming into the private business network environment. Not only are staff workers susceptible, but clients, contractors, and visitors can also be hosts to bringing in malicious data stealing software. AVG Business Edition promotes security practices such as password management with everyone using the system. Behind the scenes, AVG scans files that come through the network for any malware or exploits that can come through from the many different sources of access inside of a business. The intelligent scanning and detection engines within AVG are very good at accurately finding any malware without sacrificing computing resources. As with all AVG software products, AVG Business Edition 2012 demands less and works better. If you thought that viruses could not get onto your mobile smartphone then you may be surprised to know that cybercriminals are becoming more and more attracted to them. The marketplace of Android based cell phones means that there are millions of devices which are essentially small PCs running software that were only possible on desktops just a few years ago. More frightening, most Android phones have data plans which connects them to the internet at any time. These facts indicate that malware and viruses are sure to increase in the mobile space not even mentioning the already existing threats on the Android platform. The good news for everyone is that where they can expect viruses, they can also expect free antivirus provided by AVG. The next time you are browsing the Android Market be sure to search for AVG Free Antivirus and download it directly to your phone. The Android edition of AVG Antivirus has brilliant features you could only get on a smartphone such as GPS locating a stolen device, SMS scanning, and remote management of apps. The Pro version not only checks SMS for viruses but also gives you real time spam blocking, and does not include any ads. Whether or not you think that your phone is vulnerable to viruses or other malicious internet attacks, there is always the option of downloading AVG Free Antivirus for your phone. The curious will at least download the app for a quick test anyways. AVG Antivirus is available directly on the Android Market for safe and easy downloading and for future updates as well. Every year AVG releases an updated version of their AVG Free Edition software. This year is no exception and has everyone ready to enter into the year 2011 with a brand new version of AVG AntiVirus. AVG promises the usual – faster scanning, better scanning, and easier to use. Every year we think how can they top the current product offering and every year we are pleasantly surprised. The first difference you may notice from downloading the new AVG 2011 edition is the simpler installation process. Previously, the time taken to download AVG, although snappy on broadband connections, can be slower on those with ancient dial-up connections. The new download is no different and remains relatively the same file size. However, the big change is that the installation procedure no longer requires thirteen separate steps and instead is done in just five. Everyone today is talking about the cloud and cloud computing. AVG incorporates the concept of the cloud by taking advantage of the fact that millions of users all over the world are proactively analyzing files on their own systems and they are reporting their findings with their anti-virus products. This allows users of the newest AVG Free to download in the background information contained within the cloud in order to help the end user determine the threat levels of specific files on their PC. Because everyone is using Myspace and Facebook these days, the newest update to the AVG LinkScanner has included support for these popular social networking sites which are often targeted because of their emense popularity and ease of access that allows anyone to post any link they want. AVG LinkScanner will mark each link on the webpage with a check to tell you if they are safe or not. AVG proclaims that they stop thousands of threats everyday on Facebook alone. Those that may have abandoned AVG Free Edition because the scanning engine was not up to par with other free antivirus solutions can come back to AVG Free Edition 2011 knowing that no longer is the free and paid scanning engine any different. You get the same upgraded virus scanning engine that was previously only included in the full upgraded version of the software. Users of Windows Vista and Windows 7 may also appreciate the fact that they can now run their antivirus from the gadget menu on their desktop. Users have many reasons to upgrade to the newest 2011 edition of AVG Free and they are welcome to download AVG Free off of our website. New users should also consider AVG Free Edition 2011 when looking for a antivirus software suite that can help protect them in the social networking age. Today there really is no excuse for not having antivirus installed on your PC. Most lurking internet dangers can be thwarted by using free antivirus solutions. Perhaps the wisest choice in free antivirus would be AVG. Few people realize how vulnerable they are online. The cyber criminals are out there waiting – armed with viruses, worms, trojans, and phishing. Anyone caught in the trap today has no excuse because of the availability of AVG Free. Most other free antivirus will be able to scan your files for malicious software and remove it, but often require you to run them manually, or have definitions that are sorely out of date leaving you vulnerable to the ever updated threats. AVG on the other hand, features heuristic scanning in real time, protecting you from threats as they happen instead of after the fact. Not only that, but AVG monitors your web traffic for any malicious links as you browse, keeping you safe. Users of AVG should keep in mind that they still need to remain diligent when online. Always update your virus definitions frequently. This can be done automatically by setting the preferences in the AVG interface. Do not browse suspicious websites. Although AVG Free will likely protect you from malicious websites, phishing dangers can sometimes go on for several hours before they are finally detected. If you use your computer for work purposes or are otherwise very active online, the decision to purchase the full featured version of AVG may become more sensible. The upgraded versions of AVG include more sophisticated detection of malware such as the anti-rootkit, anti-spam, and firewall. Many users also will want free live support which is only included in the paid version of AVG. Ultimately the choice will be for the user to decide if they want to purchase the additional features, which are not absolutely required but can be a convenience for a lot of people. The cyber world possesses many dangers, with new ones emerging every day. Instead of worrying, there really is no excuse not to be using AVG, especially when AVG Free Edition can be downloaded and installed easily without paying any money and will give your system essential protections. AVG Technologies, which develops the popular Free Anti-Virus AVG, has researched today the findings of rogue antivirus on social networking sites such as facebook. AVG indicated that the AVG software found and blocked more than 300,000 rogue applications last weekend. The attack was pushed using an image of a woman in a bikini. The same ad-supported viewer has been seen in other forms the previous week. AVG is set to automatically detect such anomalies and report to security researchers who can investigate the matter further. AVG’s server had detected more than 200,000 of the particular threat. Later that number dwindled down to only a couple hundred per day. Just when the AVG Free team thought that the threat would cease, all indications pointed to the nefarious group ramping up to do another fresh campaign. While AVG understands the powerful uses of social networking and believes they should not be given up, AVG recommends some basic security checklists that users can perform. Make sure you use AVG LinkScanner technology when browsing social networking sites so that you will be able to see which links are good and which may be unsafe. Make sure you download AVG Free updates regularly and keep your other software updated as well. Several years ago the only anti-virus protection available required an annual subscription fee or large upfront costs. Today users have the luxury of choosing free anti-virus products they can download for free off the web and use without paying anything. AVG Free Edition is the most appreciated free anti-virus software on the web amongst users with now over 110 million users. AVG Anti-Virus Free Edition has earned its name and reputation through quality, speed, and effectiveness. AVG Provides a large repository of options and modules. Anti-Spyware, Anti-Rootkit, Realtime protection and heuristic analysis of suspicious files. AVG also includes such novel features as email scanning and web link verification. Downloading and installing AVG Free Edition Anti-Virus is relatively straight-forward with only a few steps. After you download AVG, you are given options to select which subcomponents you would like to install. The overall installation process is smooth and does not introduce any incredibly tough choices. The installation process is only just the beginning of AVG Free Edition. There are far more important aspects to AVG such as behavior patterns, detection rates, and resource usage. Testing the detection capabilities of AVG Free Edition is tough because it entails downloading thousands of malware samples and scanning each one. After downloading over 9,000 viruses, worms, trojans, and rootkits, they were sent off to AVG Free Edition for scanning. Our tests found that roughly 94% of the malwares were detected and quarantined. Although a small percentage were undetected, this will happen with any anti-virus solution and the percentage that were detected and quarantined was actually extremely high compared to most other anti-virus even paid ones. After setting up a clean installation of Windows to test AVG Free without any other software getting in the way, we ran several tests to determine the resource usage and speed of AVG Free Edition. There are several processor priority settings which affect both scan speed and CPU usage and the lowest setting ran the scan in just 17 minutes, while using about 20% of the CPU. The next highest setting completed the scan in 15 minutes but used 40% of the CPU. Finally we tried the fastest priority setting and it did an entire scan in just 8 minutes but really bogged down the system using 100% of the CPU most of the time. AVG Free Edition has been built with the average PC user in mind when designing its simplistic user interface. If the wording of each function were not apparent to the end user of what each function performed, there is a concise help file that will explain everything to them. The main AVG window will display the current state of all of the installed components where you can enabled and disable individual components as you desire. Click on any of the component icons and you will be taken to a subpage where you can configure the specific functionality. The interface for scanning the system allows a few basic options for novice users and lots of detailed configurations for more experienced users. You can choose directories to scan and whether to check for rootkits. You can also have AVG Free scan network folders across your LAN. After the scan takes place, you will be given a summary of what was found. You can quarantine the files so that they will not affect your system any more but still allow you to retrieve them later in case there was a false positive. There is also an option to simply delete the files or even download them to AVG for further analysis. AVG Free Edition includes a plethora of anti-virus components in an easy to download and use package. 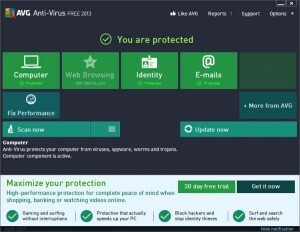 AVG Free definitely has an edge over other free anti-virus solutions when it comes to features. AVG Free Edition remains the top download choice for PC users all over the world. Even if you already have downloaded AVG Free Edition, you must always keep up to date with the latest virus definitions and updates in order to tackle the latest threats. AVG Anti-Virus Free is a good solution and always is just one click away from the newest update. Having the latest updates is the key to any anti-virus software and is no different with AVG. The update files can be downloaded as a standalone file that can be extracted to a temporary location on your PC and then installed. Otherwise, the updates can be downloaded from within the AVG Anti-Virus interface.